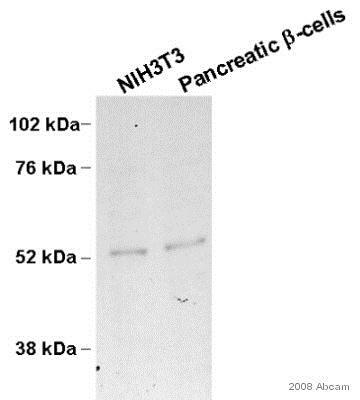 Recognizes endogenous levels of p53 (pS15) protein. WB: HEK-293T cells incubated with etoposide. MCF7 cells incubated with camptothecin. 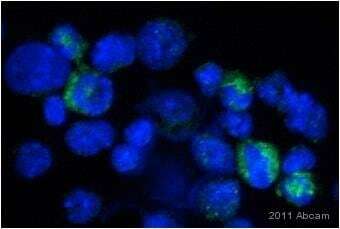 UV treated HeLa whole cell lysate. 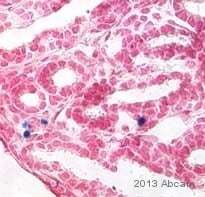 IHC-Fr: Mouse fetal lung tissue. Our Abpromise guarantee covers the use of ab1431 in the following tested applications. WB 1/500 - 1/1000. Predicted molecular weight: 53 kDa. SDS PAGE performed under reducing conditions (100mM DTT, Sample heated at 50°C). Blocking: 5% Milk + PBS for 3 hours at RT. 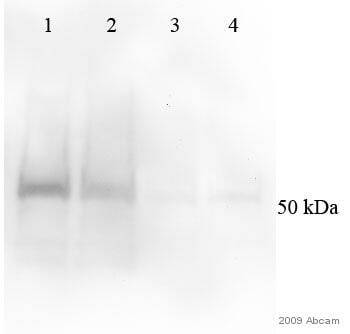 Primary antibody: 5% BSA + PBS overnight at 4 C.
Secondary antibody: 5% Milk + PBS for 2 hour at RT. ab1431 staining p53 in rat bone marrow cells by Immunocytochemistry/ Immunofluorescence. The cells were fixed in paraformaldehyde, permeabilized in 0.1% Triton X-100 and then blocked using 5% BSA for 1 hour at 25°C. Samples were then incubated with primary antibody at 1:100 for 9 hours at 4°C. 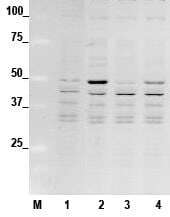 The secondary antibody used was a goat anti-rabbit Alexa Fluor® 488 (green) ab150077) used at a 1/250 dilution. DAPI was used to stain the cell nuclei (blue). These pictures were taken in the different fields of the same bone marrow cell slide. 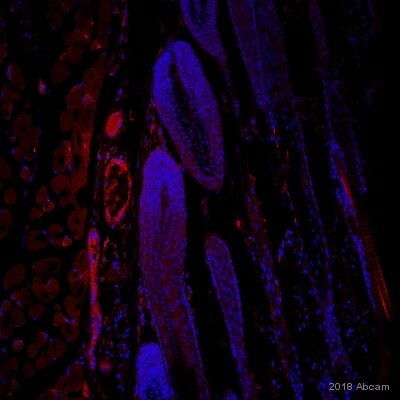 Immunohistochemical analysis of mouse fetal lung tissue labeling p53 with ab1431 at 1/100 dilution, followed by Goat anti-Rabbit IgG at 1/200 dilution. ab1431 staining p53 in mouse bone marrow WBCs cells by ICC/IF (Immunocytochemistry/immunofluorescence). Cells were fixed with formaldehyde, permeabilized with 0.1% Triton X-100 and blocked with 5% serum for 2 hours at 25°C. Samples were incubated with primary antibody (1/100 in PBS) for 12 hours at 4°C. 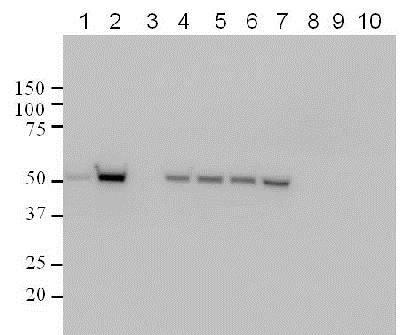 An Alexa Fluor® 488-conjugated Goat anti-rabbit IgG polyclonal (1/500) was used as the secondary antibody. Publishing research using ab1431? Please let us know so that we can cite the reference in this datasheet.